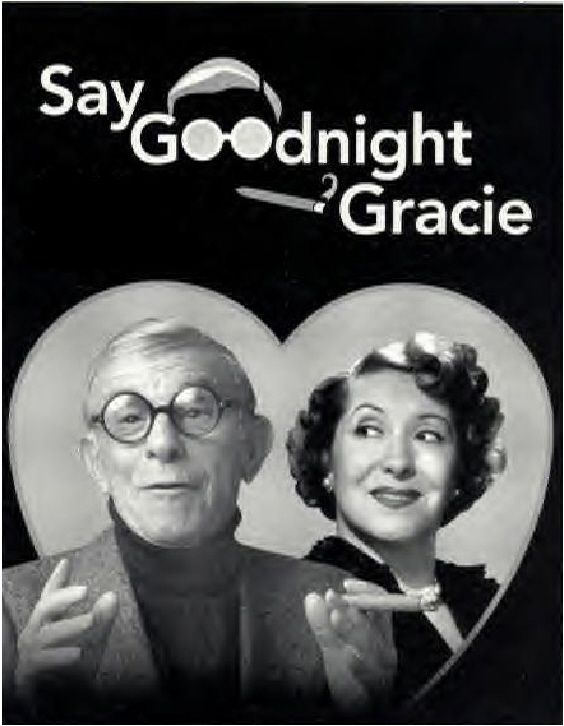 In Say Goodnight Gracie at the Eisemann Center for Performing Arts, George Burns and Gracie Allen are a match made in comedy heaven. Say Goodnight Gracieis the story of a Jewish boy in search of a good shtick, who finds a shiksa instead. The funny kid was named Nathan Birnbaum, better known as George Burns, and he hailed from the Jewish tenements of the Lower East Side of New York, a working-class immigrant neighborhood back in the early 20th century. Inspired by a Jewish culture that was facile with language and direct in approach, Burns became a star of vaudeville, radio, television and film. In Burns and other assimilated Jewish comedians (Jack Benny, Eddie Cantor and many more), the quick wit of the city streets fused with the mercantile mindset to give the audience exactly what it wanted. And what it wanted were jokes. For a comedy freak like me, Say Goodnight Gracie, written by Rupert Holmes and starring Alan Safier (who has played the role in New York and across the U.S.), is a study in the Jewish roots of American stage comedy, its origins in vaudeville and its flowering in radio. This was comedy that was less about personal perspective and more about rhythmic patter and punch lines, often fused with music and dance. It runs at the Eisemann Center for Performing Arts through Saturday. Gracie: My sister Bessie had a brand-new baby. Gracie: I don’t know, and I can’t wait to get home to find out if I’m an aunt or an uncle. In the first half of the 20th century, duos or double acts were big. Feed and foil: one was the reasonable straight man who “fed” the lines, while the other served as “foil” or comic relief. It worked well on the vaudeville stage, and worked well in radio. Just like the Dread Pirate Roberts in The Princess Bride, a duo’s name could live on even if the performers changed. Duos were constantly coupling and uncoupling, but the important thing was: the shtick remained. It was all about the shtick—the hook or gimmick of a comedy act. An original shtick with great legs could carry a performer far, all the way through to the rim-shot. George: Look, it’s got a coat of arms. It’s a bonafide castle. Gracie: Oh, that’s where Napoleon came from. Burns found everything he was looking for in Gracie Allen, the Catholic daughter of an Irish hoofer who left when she was six. Gracie performed with her sisters in an Irish dance act before following one of them to New York’s vaudeville scene. Say Goodnight Gracie is the story of Burns meeting and wooing Allen, ultimately creating a comedy team that spanned over 40 years. It’s filled with tidbits even ardent Burns fans might not know: how a job stirring syrup in a candy factory led to the stage, after passers-by heard George and co-workers singing four-part harmony and tossed coins through the open window. Through it all, the shtick remained the same: illogical logic. Burns tried his paradoxical jokes and routines with a number of partners, never getting the laughs he wanted. Then he tried it with Allen, and wonderful things started to happen. Interestingly, Burns had planned to play the ditzy character himself, with Allen as the straight “man”—rather progressive for that era. But at their first performance, Burns realized the audience laughed at anything Allen said, no matter how serious. They switched roles. Burns became the straight man, master of the arched eyebrow and stunned response, creating an entire comic language from the smoking and handling of a cigar. George: Gracie, what day is it today? Gracie: Well, I don’t know. George: You can find out if you look at that paper on your desk. Gracie: Oh, George, that doesn’t help. It’s yesterday’s paper. Though the premise of the play has Burns (who died at age 100) in an afterlife limbo, cajoling God into letting him pass through into heaven, Alan Safier portrays Burns in his 80s: relaxed in a brown wool sport coat, mock turtleneck and matching pocket square. He moves about the stage with an old man’s shuffling gait, from easy chair to park bench to café table for two. During some reminiscences, vintage photos play across a screen. Heavenly sections are indicated with a large waft of stage smoke, and Didi Conn is the voice of Gracie Allen. Safier enacts Burns with such gentleness, it’s hard to imagine that brash Frank Gorshin originated the role on Broadway. This is not the stage showman George Burns, once willing to wear a spinning bow tie and play straight man to a trained seal. Safier instead brings to life Nattie, as old friends called him, the kid from a family of 12 who never got past fourth grade because he was too busy bringing in money after his dad died. The kid who only wanted what his mom never had: stability, and a partner for life. Every time Safier dips into material from the Lower East Side days, and touches on Burns’ lifelong friendships from that era (most notably with Jack Benny), there’s a true joy about it. Sections of pathos also resonate authentically, as we watch the elderly Burns step into his best friend’s role in The Sunshine Boys as Benny is dying of pancreatic cancer, while also knowing it would rejuvenate his career. The play by Rupert Holmes craftily condenses a century of very full living by Burns, deftly threading the personal into the professional. It never feels like a bio-pic transferred to the stage; rather, it’s as if the audience is privy to Burns’ own, very private ruminations. The final segment, with Safier’s impassioned recap of a life, his voice brimming with wonder at all the serendipitous connections that fed Burns’ success, is truly an act of subtle, loving showmanship. The audience, primarily over 60, audibly sighed over the sad parts and swooned over the romance with Gracie, chuckling at every joke. Afterward the aisles and lobby burbled with animated chatter, “remembering when” through the play’s soft filter. They, and Burns, were young again. A comedian can’t ask for a better chance at immortality than that. George: Hasn’t your mother ever tried to do something about your brother Willie’s drinking? Gracie: She sent him to a psychiatrist, and the psychiatrist worked and worked to get to the bottom of his drinking, and finally he found out Willie’s problem. Gracie: He likes to drink.